This decorative pillow is made from 100% Certified organic cotton and handcrafted in California using materials sourced in the United States. All materials are of the highest quality, grown and manufactured according to the strictest environmental standards. All pillows are free of pesticides, synthetic fertilizers, and irradiation. The result is a pure, natural fabric that is as healthy for you as it is for the soil, air, and water, and the agricultural community that supports its production. Everything that goes into these pillows – from the fabric to the thread to the ties – is Made in the U.S.A. This not only ensures compliance with environmental and ethical standards, but it also means that local families and the employers who have chosen to stay on U.S. soil are supported. 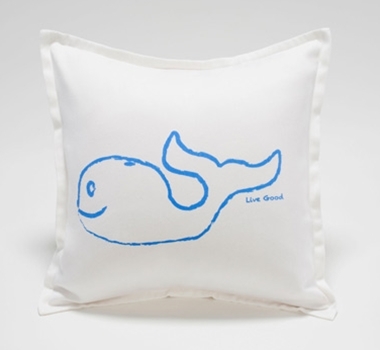 Bright cerulean blue makes this love-able whale as cheery as a day at the beach. She represents several species of whales now facing extinction. The image is screened onto organic white cotton sateen using water-based ink, and the back closure features soft fabric ties. Each pillow comes with an organic insert stuffed with organic fibers from the kapok tree. These inserts are moisture-resistant, quick-drying, lightweight, completely hypo-allergenic, mold resistant and odorless. Please note that this pillow is not meant to be used inside Cribs or Cradles. It is a decorate pillow for your nursery. Available in White with water based ink.